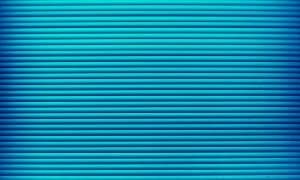 If you run a website or are active in digital marketing, there’s a good chance you’ve heard of a tool called Google Tag Manager. Maybe it even intrigued you enough to get you to head to the landing page where…well, things get a little overwhelming. I’m here to tell you that’s not the case. 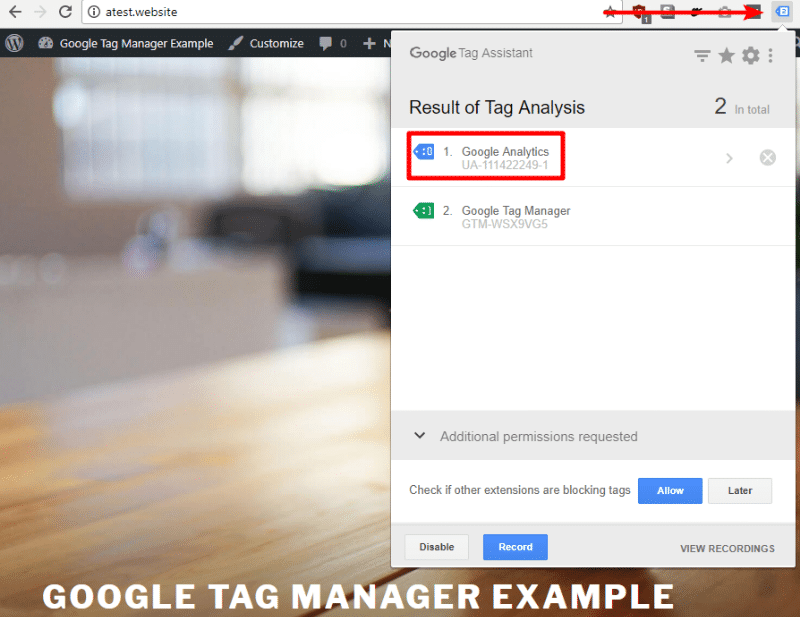 Google Tag Manager is an awesome tool for all websites, from large to small. 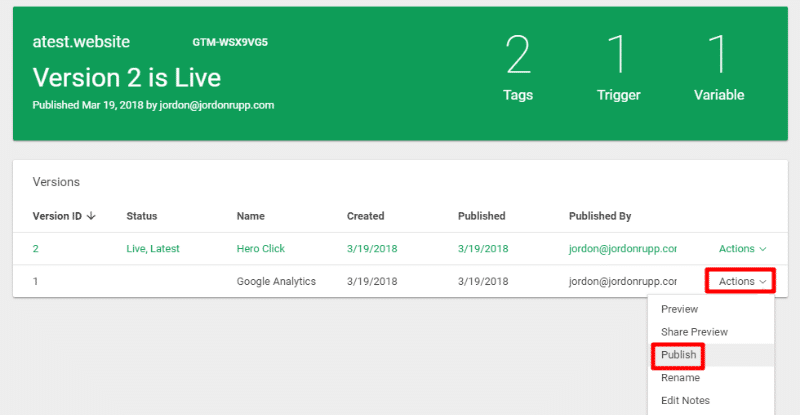 And in this Google Tag Manager guide, I aim to show you just how powerful this tool is, as well as how you can use it to unlock important insights from your site while simplifying your workflows at the same time. Of course, that definition isn’t very useful if you don’t know what tags are or why you need something to help you manage them (Google’s marketing team might want to think about this fact!). 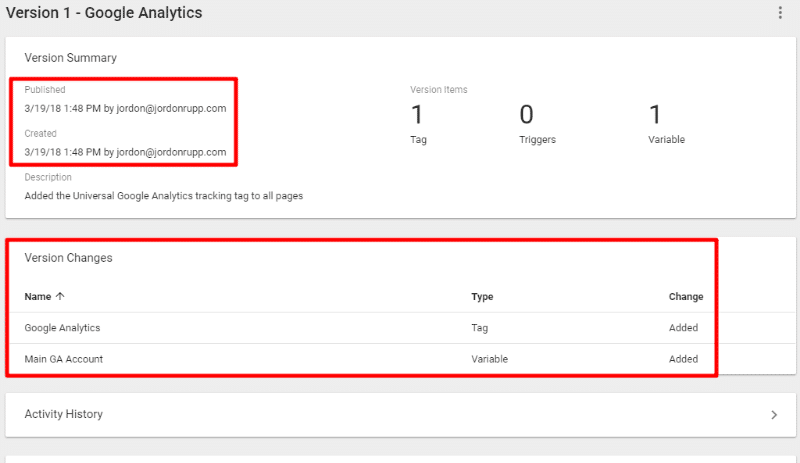 A popular example of the type of code that you can add with Google Tag Manager is the Google Analytics tracking snippet, but the uses are a lot broader than just that. So why do you need a tool to help you manage all those code snippets? Well, before Google Tag Manager, you’d have to hard-code every single snippet into your site’s actual source code. That means you, or your developer, had to actually open up your site’s code, add the snippet, configure it to only show up at the right time/spot, and then push it live. Google Tag Manager simplifies this a lot. Instead of that lengthy, and recurring, process, you add the Google Tag Manager snippets one time. 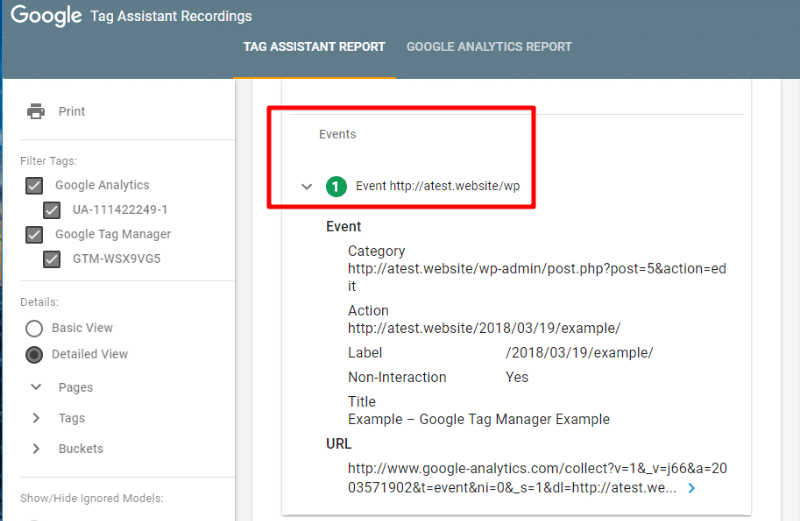 Then, whenever you need to add a new script (“tag”) to your site, you can do it right through the Google Tag Manager interface – no code required. Triggers – when and where a specific tag is executed. Variables – these let you receive and store information from your website pages that’s used by your tags and/or triggers. Versions – these help you manage different versions of your code snippets and look back at the past with a changelog. Simplify and speed up the process of adding new scripts to your site by eliminating the need to manually edit any code. Give you more control over when and where those snippets are actually active. Let you pass additional information to those snippets via variables. Add version control, a changelog, and user access permissions so that you can better control which scripts are active and who has access to manage/add new scripts. In this section, I’ll take you through the basic process of getting your site up and running with Google Tag Manager. 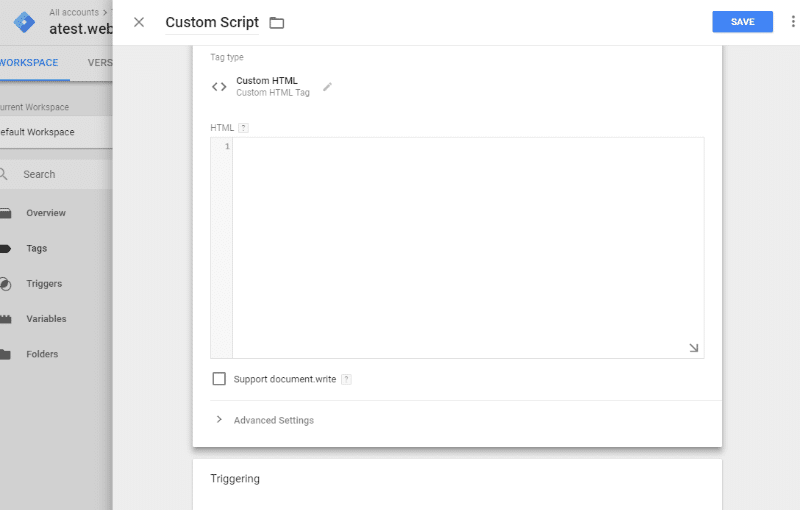 Then, over the next sections, I’ll share some of the types of scripts that you can add, as well as some more advanced tips for getting more from Google Tag Manager. 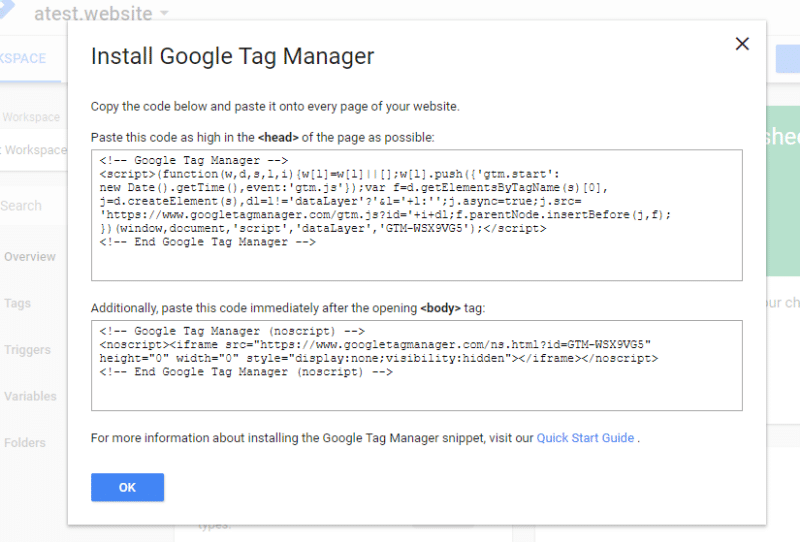 Yes, I know it’s a bit humorous that I told you all about how Google Tag Manager will eliminate code from your workflow and now I’m telling you to dig into your site’s code. But – this is a one-time process. And once you get this out of the way, you’ll be able to perform pretty much everything else without looking at any code. In the Setup Container section, enter a name for your container. It can be anything – but you probably want to make it your website name for convenience. Then, choose where you’re going to use the container. Most of the time, you’ll want to select Web (that’s what you use when you plan to use Google Tag Manager on a regular website). 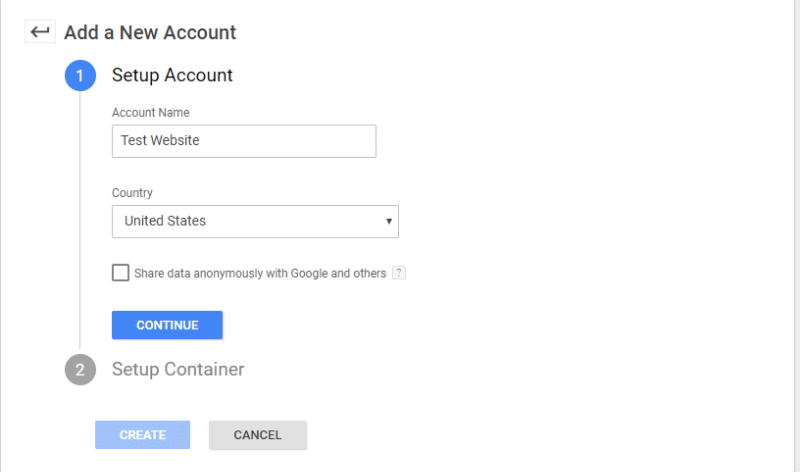 Once you accept the Google Tag Manager Terms of Service Agreement, you’ve created a Google Tag Manager container for your site. As the prompt above indicates, you’ll need to add two different code snippets to your site to finish the process. One code snippet goes in your <head> section, and the other goes in your <body> section. 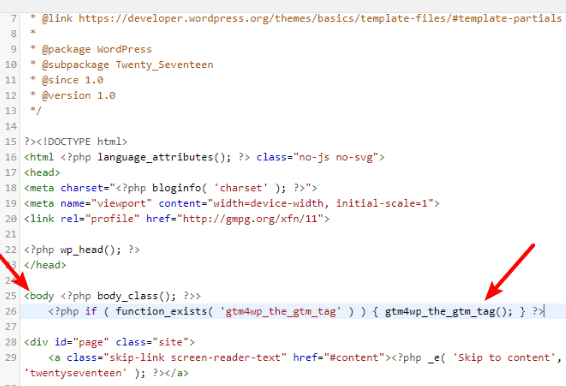 I’m going to show you how to do this in WordPress. But if you have a different content management system, you’ll probably want to speak to your developer if you’re not sure what I mean by <head> and <body>. For the simplest way to add Google Tag Manager to your site, you can use the free Head, Footer and Post Injections plugin. Unlike the method in the next section, this one won’t let you pass any additional information to Google Tag Manager. But for basic use, this solution is totally fine. First, you need to actually get those code snippets on your site. **Genesis users should select Custom. If you do experience any issues with your theme as a result of the “Codeless Injection”, you can go back and select Custom in the plugin’s settings. If you’re using a WordPress theme with easy-to-access hooks – like Genesis or GeneratePress – you can also add each code snippet to the relevant hook. Once you have the snippets added to your site, you’re ready to forget about code and start using the Google Tag Manager interface. Tag – a tag is a single script. For example, the Google Analytics tracking code is one tag. Container – this is basically a bucket that holds all of your individual tags (along with associated triggers and variables). 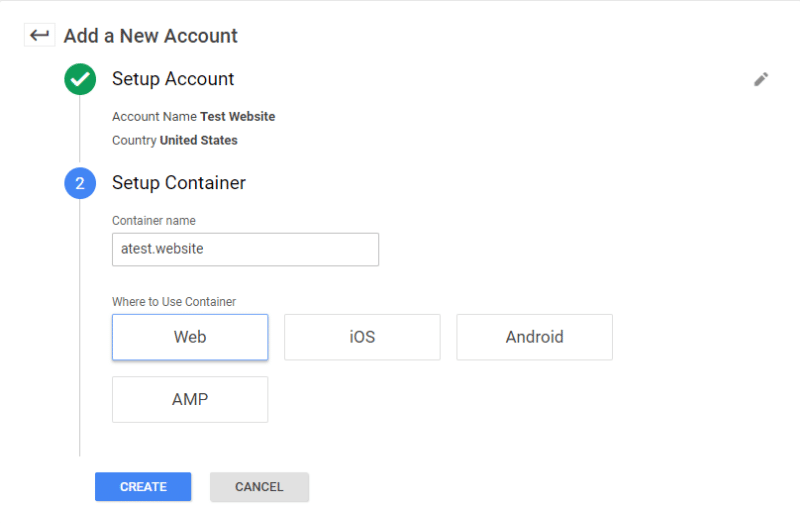 You can actually create multiple containers – more on this later. Trigger – a trigger is something that actually causes your tag to “fire”. For some scripts – like Google Analytics – you’ll want it to fire on every single page view. For others, you might want it to only fire on a specific event (like a person clicking a button). Variables – variables are tied to triggers. They let you get more granular by passing additional information. For example, instead of saying track “all clicks“, a variable would let you say “only track clicks on this specific URL“. Beyond that, they can also pass additional information to Google Tag Manager (like information about a visit or visitor). Now, let’s get into how to actually add a tag. To do that, we’ll use one of the simplest examples – Google Analytics. 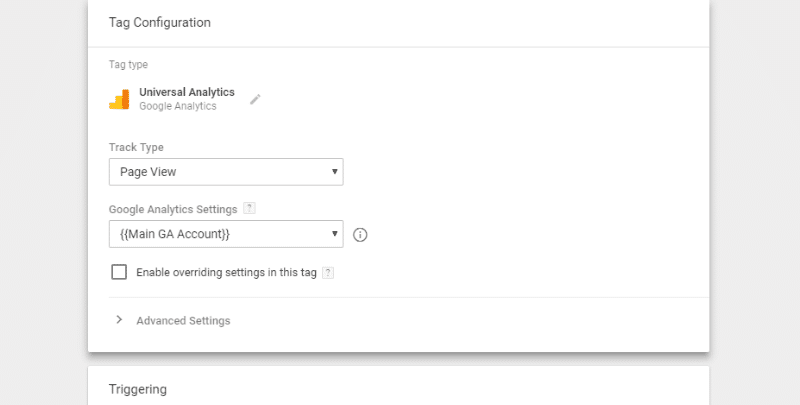 Part of what makes it simple is that Google Tag Manager already includes a built-in tag to help you add Google Analytics. I’m going to go very in-depth for this first tag so that you get the hang of things. But after this first example, I’ll speed things up a bit. Tag Configuration – what type of tag to add. Triggering – when to actually “fire” this tag. To get started, click anywhere in the Tag Configuration box. Leave the Track Type as Page View for general Google Analytics tracking. 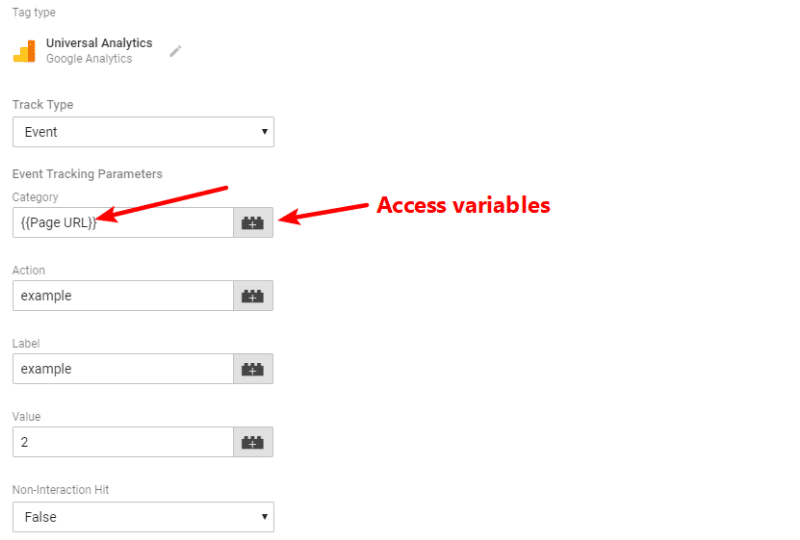 Then, in the Google Analytics Settings drop-down, select New Variable. But you still need to determine when to fire that tag. To set up Triggering, click anywhere on the Triggering box. To create a new trigger, you can use the Plus icon in the top-right corner. But, for Google Analytics, you actually want the tag to fire on all pages so that we get comprehensive tracking data. And that’s it – congrats! You just created your first tag. 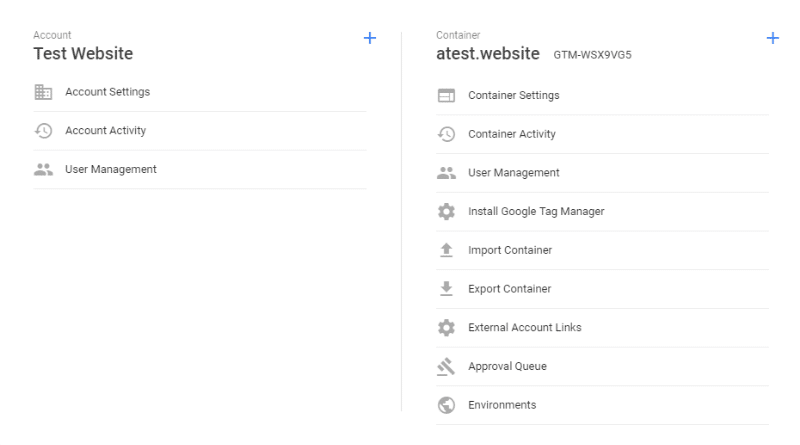 At this point, you have a tag in your Google Tag Manager container…but it’s not live on your site yet. This functionality is handy because it ensures you don’t accidentally make something live. And it’s also great if you’re working as part of a team because it ensures you know exactly who is making changes and when. To publish your container, you click the Submit button in the top-right corner (marked above). And that’s it! 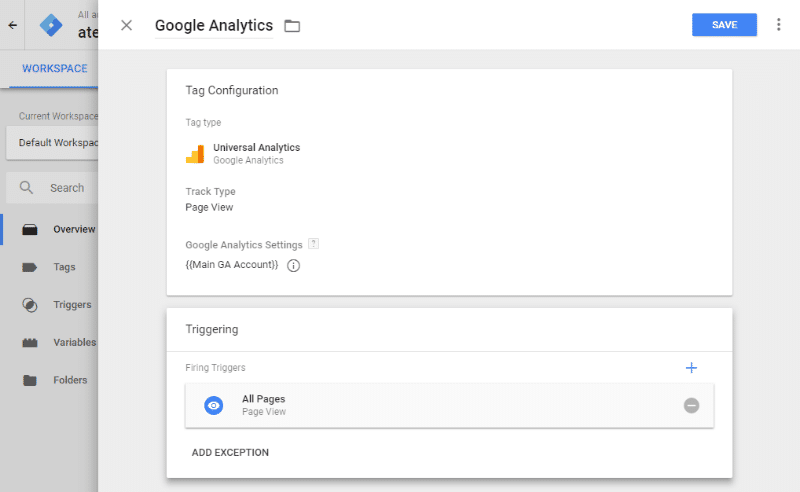 Google Tag Manager will give you a summary so that you know the exact changes that were made and by whom. You can always pull this information up later if needed. If you want to make sure that your tags are firing as specified, Google offers a free browser extension called Google Tag Assistant. Enable Google Tag Assistant on a site by clicking the icon and choosing Enable. As you start to add more complicated tags, especially those that only fire under certain conditions, Tag Assistant and its Record functionality become a lot more necessary to make sure everything is working properly. Beyond making sure your tags are actually loading, I also suggest that you test your page load times before and after using a tool like GTmetrix to ensure that none of the scripts you added are having a major effect on your site’s page load times. 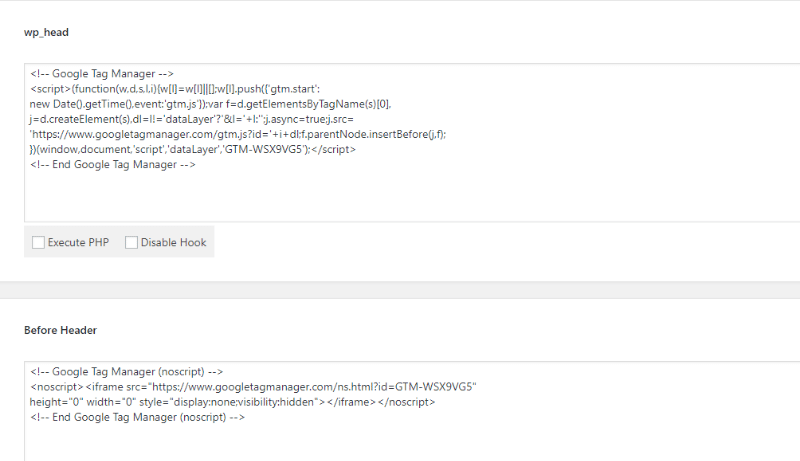 So far, we haven’t really done anything cool with Google Tag Manager. 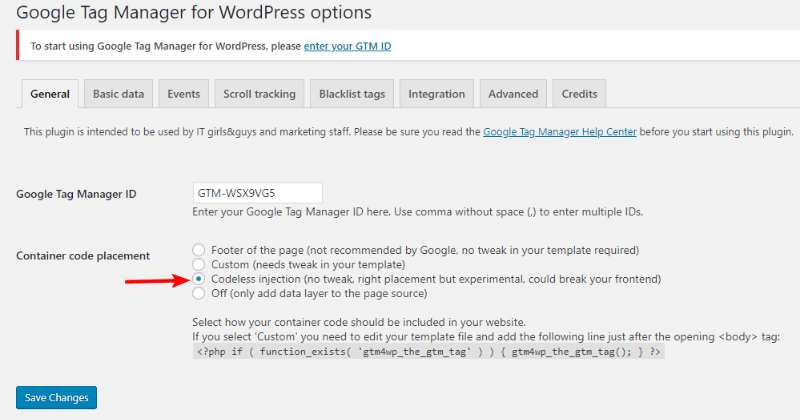 I mean, adding Google Analytics to WordPress isn’t that hard, so what’s the point of going through the trouble of Google Tag Manager? Well, here’s where things start to get cool. 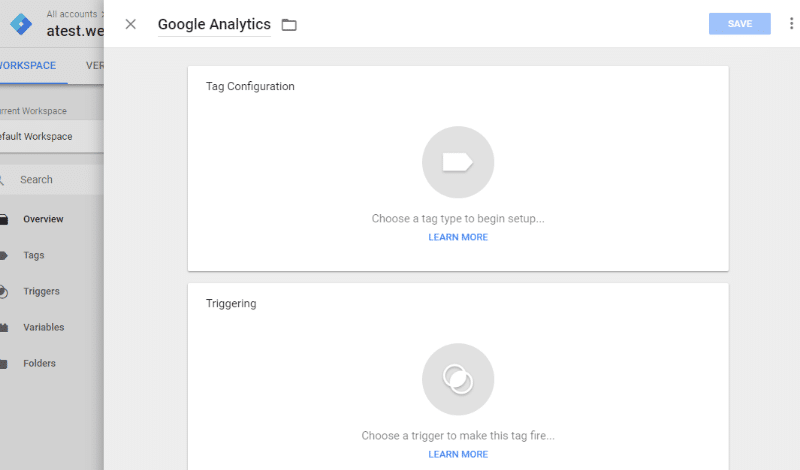 While I’ll still only be able to scratch the surface of what you can do with Google Tag Manager, here are a couple of more advanced types of tags that you can add. I’m going to go through this section quicker and assume you can follow along with the basic process of adding a tag after the example above. For this example, I’ll show you how to track clicks on a CTA button with the CSS class “hero-cta”. Then, set up your Triggering. Triggers are where you make event tracking come alive. Use the Plus icon to add a new trigger. Then, click to begin the Trigger Configuration. Then, because you want to track a specific CTA button instead of all clicks, you’d select Some Clicks. 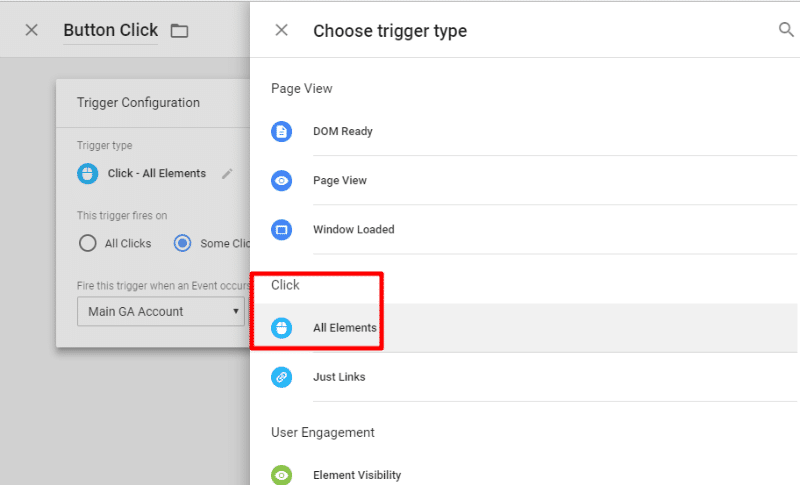 *If you don’t see the Click Element option in the drop-down, go to Variables → Built-in Variables → Configure in your Workspace dashboard and check the box for Click Element. And for another way to set up comprehensive event tracking, you can use a service called Komito Analytics. If you want to A/B test your site, Google Tag Manager makes it easy to add the code snippets for Google Optimize or a service like Optimizely. 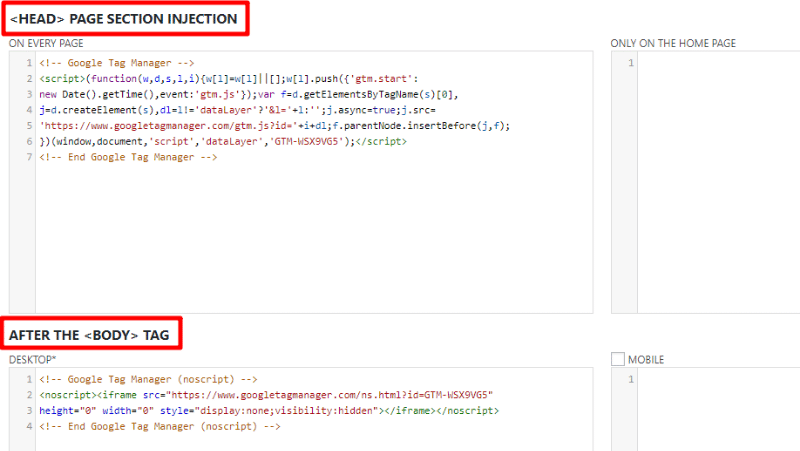 Optimizely also offers detailed tutorials for how to get up and running with Google Tag Manager. Hotjar and Crazy Egg help you learn more about the user experience on your site by tracking what your visitors do through features like heat maps, screen recordings, form analysis, and more. By learning about what your visitors are doing on your site, you can see where your user experience excels…or needs to be improved. Both services are also easy to add because there are premade tags for each. Finally, I want to talk about the Custom HTML and/or Custom Image tags. At this point, you should have a solid grasp on how to add new tags, what’s available to you, and how to publish those tags to your live site. Now, I want to round things out with a look at how you can more effectively manage your Google Tag Manager interface, as well as some tips and best practices for going forward. Each workspace is like a separate “draft” of your container. While you can only have one container live at a time, you can publish that container from different workspaces. Make sure to descriptively name your tags. When you first get started, it’s easy to keep track of different tags. But as your account grows, you’ll appreciate having clear, consistent tag names. Create new workspaces for big changes. This allows you to safely test out changes without jeopardizing your current tracking. Use folders to stay organized. You can create folders in the Folders tab in your main dashboard. Add detailed comments to new versions. This helps you easily track what changed in each version later on. Use separate container IDs for Prod/Staging/Development. You can create a new container in the Admin tab. Always test your tags. You can use the Google Tag Assistant extension to do this. And that wraps up this rather lengthy Google Tag Manager guide. 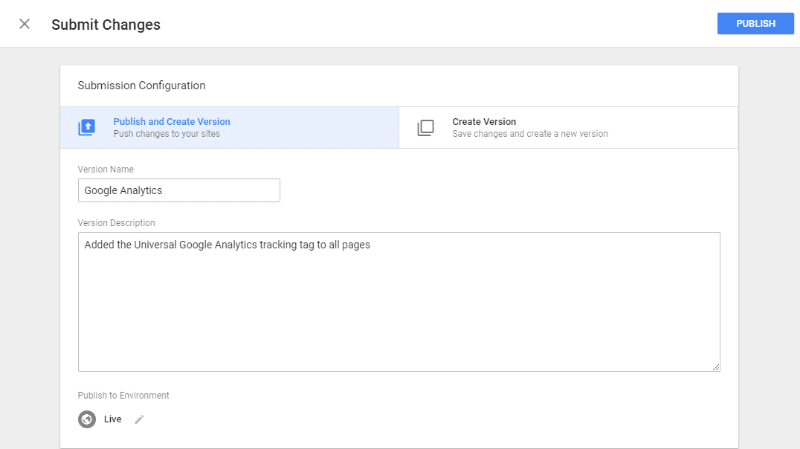 Have any other questions about how to get up and running with Google Tag Manager? Leave a question and I’ll try to help out. Use the form below to tell me a little about your website project.